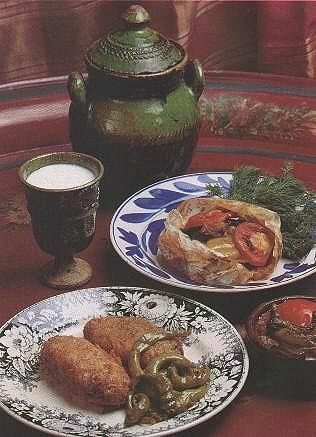 The importance of culinary art for the Ottoman Sultans is evident to every visitor of Topkapi Palace. The huge kitchens were housed in several buildings under ten domes. A survey of types of dishes according to their ingredients, may be helpful to explain the basic structure of Turkish cuisine. Otherwise, it may appear to have an over whelming variety of dishes, each with a unique combination of ingredients, way of preparation and presentation. All dishes can be conveniently categorized into: grainbased, grilled meats, vegetables, fish and seafood, desserts and beverages. Before describing each of these categories, some general comments are necessary. The foundation of cuisine is based on grains (rice and wheat) and vegetables. Each category of dishes contains only one or two types of main ingredients. Turks are purists in their culinary taste; the dishes are supposed to bring out the flavour of the main ingredient rather than hiding it behind sauces or spices. Thus, eggplant should taste like eggplant, lamb like lamb, pumpkin like pumpkin. Contrary to the prevalent Western impression of Turkish food, spices and herbs are used very sparingly and singularly. For example, either mint or dill weed are used with zucchini, parsley with eggplant, a few cloves of garlic has its place in some cold vegetable dishes, cumin is sprinkled over red lentil soup or mixed in ground meat when making "kofte". Lemon and yogurt are used to complement both meat and vegetable dishes, to balance the taste of olive oil or meat. Most desserts and fruit dishes do not call for any spices, so their flavours are refined and subtle. There are major classes of meatless dishes. When meat is used, it is used sparingly. Even with the meat kebabs, the "pide" or the flat bread occupies the largest part of the portion along with vegetables or yogurt. Turkisn cuisine also boasts a variety of authentic contributions in the dessert and beverage categories. For Turks, the setting is as important as the food itself. Therefore, food-related places need to be surveyed, as well as dishes and eating protocol. Among the "great-good places" where you can find the ingredients for the cuisine, are the weekly neighbourhood markets "pazar", and the permanet markets. The most famous one of the latter type is the Spice Market in Istanbul. This is a place where every conceivable type of food item can be found, as it has always been since pre-Ottoman times. This is a truly exotic place, with hundreds of scents rising from stalls located within an ancient domed building, which was the terminal for the Spice Road. More modest markets can be found in every city center, with permanent stalls of fish and vegetables. The weekly markets are where sleepy neighbourhoods come to life, with the villagers setting up their stalls before dawn at a designated area, to sell their products. These days, handicrafts, textiles, glassware and other household items are also among the displays at the most affordable prices. What makes these places unique is the cacophony of sights, smells, sounds and activity, as well as the high quality of fresh food, which can only be obtained in the pazar. There is a lot of haggling and jostling, as people make their way through the narrow isles while the vendors compete for attention. One way to purify body and soul would be to rent an inexpensive flat by the seaside for a month every year, and live on fresh fruit and vegetables from the pazar. However, since the more likely scenario will be restaurant-hopping, here are some tips to learn the proper terminology so that you can navigate through both, the Cuisine (just in case you get the urge to cook a la Turca), and the streets of Turkish cities, where it is just as important to locate eating places as museums and archaeological wonders.